After purchasing a custom domain for your blog, you will be given some parameters to setup you new domain. Here, in this tutorial I will be guiding you on step by step on how to setup A custom Domain to replace your blogspot.com domain, with a www.com domain. Once the purchasing order is confirmed from web4africa.com your domain set up will commence the same day, so all you to do is to go to Submit Ticket and locate the Technical Support to email the technical team to configure your domain to work on your blogspot blog. In this process they will be needing the following informations below. These information will enable the redirection of the new domain to the already existing one. You will receive a follow up email once your domain is configured. Then log into your your blogger dashboard . Enter your domain name in the box: Click on edit custom domain to input your fresh domain name. Verification: make sure you type in the domain accurately. verify and then click on save. All your blog entries will now be open with your custom domain. The entire process take less that 24 hours. 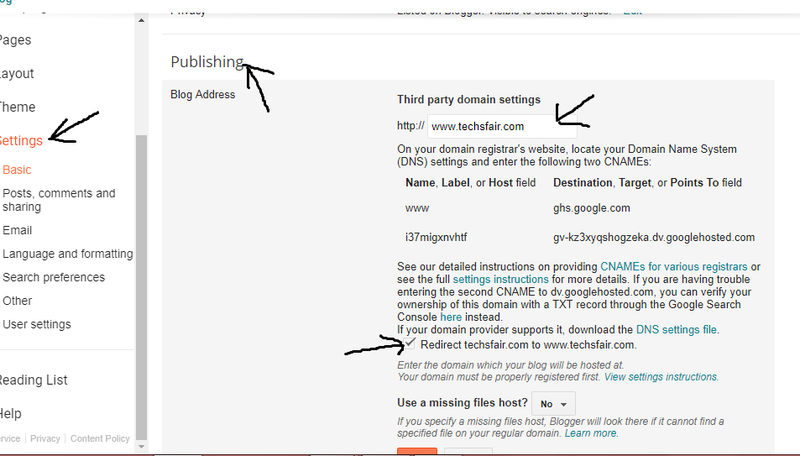 If you face any problem setting up your custom domain feel to discus with us in the comment box or use contact page.